Why do we do this? Much of the time, we are busy people or simply just lazy. We don’t wish to spend the time to consider whether every piece of information we come across is true or not. Typically, this is not a big deal, since the vast majority of the information that passes us by each day is simply a potential input to our minds without necessarily outputting it back to others. While in many cases this is a huge time saver, it can also be the root cause of propagating bad information. Compounding on this, we all have our own beliefs and biases that we hold in all aspects of our lives. Confirmation bias is one such defense mechanism of our minds. We tend to be drawn to information that supports our pre-existing beliefs and biases without even considering an opposing argument. As well, many of us engage in cognitive dissonance when confronted with our own internal contradictions about our beliefs and biases. Often, when cognitive dissonance kicks in, we react emotionally to the challenging information without even considering why we hold a belief or that we might be wrong. The purpose of this article isn’t to explain why I’m right and you’re wrong (kidding! ), but instead to challenge everyone to become better everyday thinkers. This is a subject that I’ve taken to heart over the past several years, primarily using the basic technique I’m about to discuss. While I’m still a work in progress, I’m also amazed in my progress – exercising critical thinking skills have helped the way I process new information. Before you groan… “Argh… critical thinking skills? !”, consider how processing information more efficiently and learning quickly could help you in your everyday life. So how do you magically improve those critical thinking skills? It’s a thinking process known as the Trivium Method and humankind has known about it since antiquity by various names. So why haven’t you heard about this? Chances are you’ve already encountered this process in your life, at least in part. What is the Trivium Method? The Trivium Method could be considered a formalized process on how to think. Often, we’re bombarded with information in the form of opinions that consciously or unconsciously attempt to convince us what to think about a specific topic. Psychologically, if we hear information often enough and don’t truly stop to consider the underlying knowledge behind any opinion, many of us eventually assimilate that information as “fact”, regardless if that information is actually true or false. The best modern analogy that can be drawn to the Trivium Method is that of a computer. As the name implies, there are three ordered steps involved in the Trivium Method – input, processing, and output. Through this analogy it is self-evident to point out that this method of critical thinking must always occur in that order of input, processing, and output. If you mix up any of the steps, you have nothing but garbage as a result. Before any person can gain mastery of a subject and impart wisdom to others, one must first build up a base of knowledge. This is also known as the input step (as mentioned above) or the grammar step. To gain knowledge, one must engage their five senses to answer the questions who, what, when, and where. The Trivium Method relies on the physical world and the knowledge of symbols and first principles to build upon. Children in their formative years engage in this process naturally through their curiosity. The alphabet, numbers, shapes, phonics, reading, etc. and so-forth all form this basic knowledge. From these building blocks, more advanced knowledge can be gained – for example, through reading a book. If one jumps ahead to attempt understanding without gaining prerequisite knowledge, failure will be the likely result. Consider trying to read a foreign language without having a basic understanding of words and phrases. Or, how would a computer be able to process information without a valid input to it? Once sufficient knowledge is gained in a particular subject, we need to have an understanding of that knowledge. This is also known as the processing step or the logic step. This is where conflicting pieces of knowledge need to be resolved into a consistent and coherent belief. If contradictions are present, prerequisite knowledge is missing and one should return to the input stage to learn more and resolve any contradictions. To gain understanding, a person needs to ask the question why in this step. Ad Hominem – Attacking a person (e.g. through name-calling, character assassination, etc.) as a means to discredit the speaker instead of addressing their argument directly. Ad Verecundiam – More commonly known as appeal to authority, this fallacy occurs when a claim is stated to be true because an authority (e.g. person, group, institution, etc.) supports the claim without providing additional underlying factual evidence. Ad Populum – When a belief is accepted because it is popular or held by the majority, not because it is necessarily true. Strawman Argument – Obfuscating or restating an otherwise coherent argument to a more simplistic form where the attacker can more easily defeat the argument. Appeal to Emotion – If an argument riles your emotions through tactics such as pride or fear, you should be suspicious of the claim. One good challenge to attempt in some cases is to view a belief or claim from the other side – spend some time “in the other person’s shoes”. Consider seriously why a person holds a particular belief – Were they raised with a specific viewpoint? Are they fearful of the consequences of rejecting a viewpoint? Do they possess knowledge/experience that you lack and should perhaps gain? There is something to be gained by considering competing ideas in one’s mind simultaneously without accepting them. In the end, your belief may still be true; however, if it should be proven false, there is no shame in conceding to yourself “I was wrong”. It takes courage to make this statement and in the end you’ll be a better person for it. Back to the computer analogy, if you simply output what you input, you are not adding any value to it. The logic, understanding, and processing of information is intended both as a way to filter bad or irrelevant information and is your opportunity as an individual to add value to that information from your understanding of it. Once you’ve gained the prerequisite knowledge and come to an understanding about a belief or subject, you’re ready to share it with the world! For example, by writing this article, I am attempting to convey my knowledge and understanding of the Trivium Method to you, the audience. This final step in the Trivium Method is known as the output, rhetoric, or wisdom. You are attempting to convey the how in your arguments. Thus, it is important to be able to convey your message clearly and concisely. 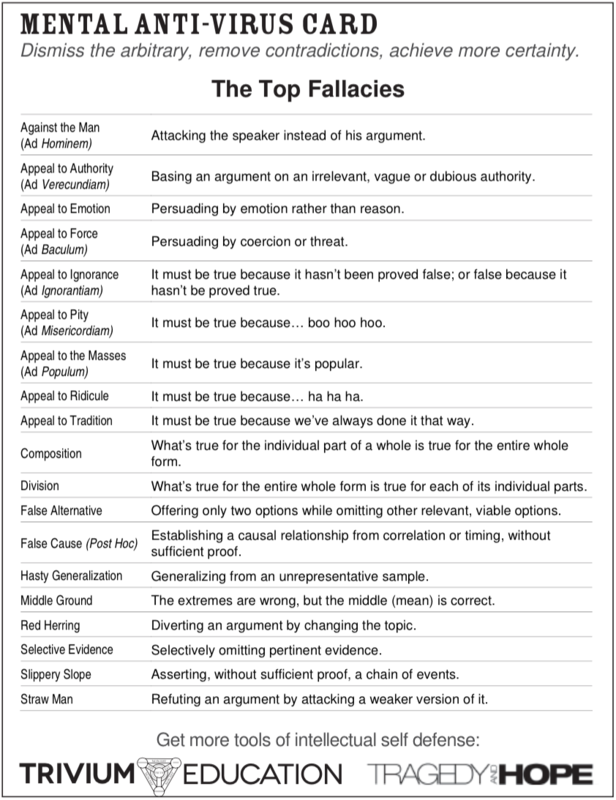 You should avoid the use of logical fallacies, as this is the lazy way to convince others of your argument. Many people have heard the phrase “empty rhetoric” or some may have been accused of engaging in sophism. Back to our computer analogy one last time, this would be akin to just outputting information, like garbage on a screen. It would be as if trying to argue for a claim without any knowledge or understanding behind it. Your language or rhetoric might be smooth on the surface, but it lacks substance, such as speaking random Spanish words elegantly without the ability to form a coherent sentence. Given time and practice, the Trivium Method can become integrated into your thinking process to the point that it occurs automatically without explicitly considering the steps. The methodology can even work in parallel with several concepts or arguments, provided the steps are always performed in order. Also, just because you get to the last step – output, rhetoric, wisdom – it does not mean you are done forever! If new knowledge comes to light, it is time to go back to the beginning and go through the methodology again. This is like a continuous feedback loop as more experience is gained and one’s wisdom grows over a lifetime. Consider this a formalized process to continually improve and become a better thinker. Since I first discovered the Trivium Method in 2011, I’ve learned about it as much as possible and have attempted to implement its principles into any and all aspects of my daily life. Am I perfect at it? No – I still fall into logical fallacies and sometimes just output what I input. The big change is that I’m more aware of the information that I come across and can more easily discover whether I should be skeptical of a particular source. It has helped me pick up new skills more efficiently by attacking a problem with the defined methodology of the Trivium Method. It gives me pause before simply sharing an idea with others. And finally, it has helped me grow and evolve as a person as I’ve gained more knowledge and experience. What confirmation biases and cognitive dissonance do you possess? Do you frequently challenge yourself and your opinions/beliefs – professional and personal – to determine what is true and what is false? Are you open to consider new information and points of view? Would the Trivium Method be something of use to you? I hope you’ll take the challenge to learn more about the Trivium Method and improve your critical thinking skills!